WASHINGTON, D.C.— House Republican Whip Steve Scalise (R-La.) took to the House Floor today to demand a vote on H.R. 962, the Born Alive Abortion Survivors Protection Act. 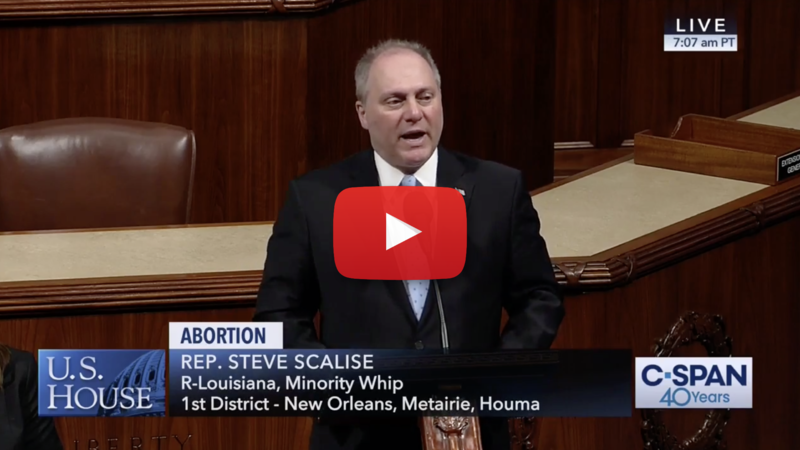 This afternoon, Whip Scalise will file a discharge petition on the bill that will force every representative to go on record on the issue of standing against infanticide. “We brought a bill forward, H.R. 962 , the Born-Alive Abortion Survivors Protection Act. This a bill, Mr. Speaker, that many wonder why is it even necessary that we need a law to say that if a baby is born alive outside of the womb we need to give it the full protections under law? Many people ask, Mr. Speaker, why is it that they aren’t already protected? “If a baby is born alive, it should have the full protections of anybody else. Yet as we see in states like New York and other states around the country they allow in those states the baby, even after it’s born alive, to be killed. To me, Mr. Speaker, that’s murder. “And yet in many states they don’t have the full protection that all of us enjoy. How could that be in the United States of America that a baby born alive can still be killed after it’s born outside of the womb? This issue transcends the abortion debate. “In fact, people across every spectrum, Republicans, Democrats, independent, even people who would align themselves as pro-choice believe it’s wrong to murder the baby after it’s born alive. Yet it’s still allowed. There should be no reason that this a gray issue. “Today, Mr. Speaker, I will be joining my colleague, Ann Wagner, the lead author of this bill, to start a discharge petition, an opportunity for every member of Congress to make their voices heard loud and clear that this bill ought to come to this floor for a full debate and ultimately for a vote. We ought to pass this law, Mr. Speaker. There should be no doubt, shouldn’t be a partisan issue, shouldn’t be an issue that we have disagreement over, yet we do. For whatever reason the Speaker will not allow this bill to come up for a vote. “We have tried time after time to move unanimous consent to bring this bill to the floor, and for months that motion has been denied. The most vulnerable among us should no longer be denied that protection under law. Mr. Speaker, this bill has to come up for a vote. “This bill has to be debated by the People’s House. Why not allow people all across the country to participate in this debate? Because as they find out about it, the reaction I get is not a debate on political lines, it’s a shock that this isn’t already law. Every baby born alive, Mr. Speaker, ought to have the full protection under law that is currently provided all of us. “So H.R. 962 should be one of the easiest things that we pass through this House. Yet, unfortunately, it’s become one of the most difficult. But that’s ok, Mr. Speaker, we know that it’s the difficult things that we come here to do, not the easy, because it would have already been done. So we’re going to be leading the charge today, standing with people all across the country, and in fact, we’re actually bringing in people, Mr. Speaker, who survived an attempted abortion.